With Q4 earnings season officially kicking off this week when the big money center banks report Q4 results, concerns about the economy and the Fed will take a back seat to what companies say about the current state of the economy, and not so much their numbers for the just concluded quarter but how they see the economic environment ahead. It is in this context that, as Goldman's David Kostin writes, "the outlook for earnings has taken center stage for equity investors" because weak guidance from several notable companies such as Apple and Macy’s "have heightened the focus on S&P 500 earnings growth." Indeed, whereas earnings was one of the clear bright spots for US equities throughout much of 2018, some investors are now questioning whether after hitting a peak late last year as the Trump tax cuts are now officially rolling off the year-over-year calendar, profits can continue to grow in 2019. One can see Q4 EPS growth with and without the benefit of taxes in the following chart from Credit Suisse. First, some background on what Wall Street expects: for 4Q 2018. consensus forecasts 12% EPS growth. 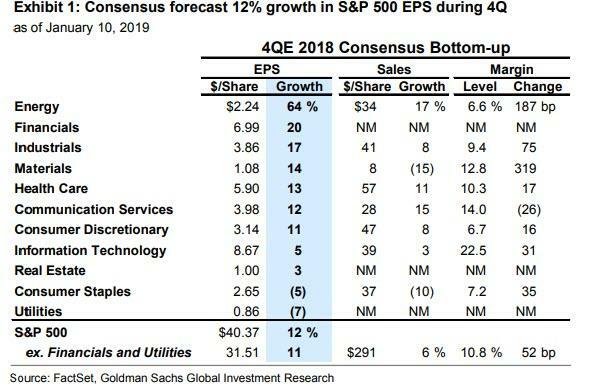 According to Goldman, if realized, S&P 500 EPS growth will have equaled 22% in 2018, the fastest annual pace of growth since 2010. Consensus also expects 52 bp of margin expansion (to 10.8%) in the fourth quarter, which is a boost from the 14% reduction in federal statutory corporate tax rates. 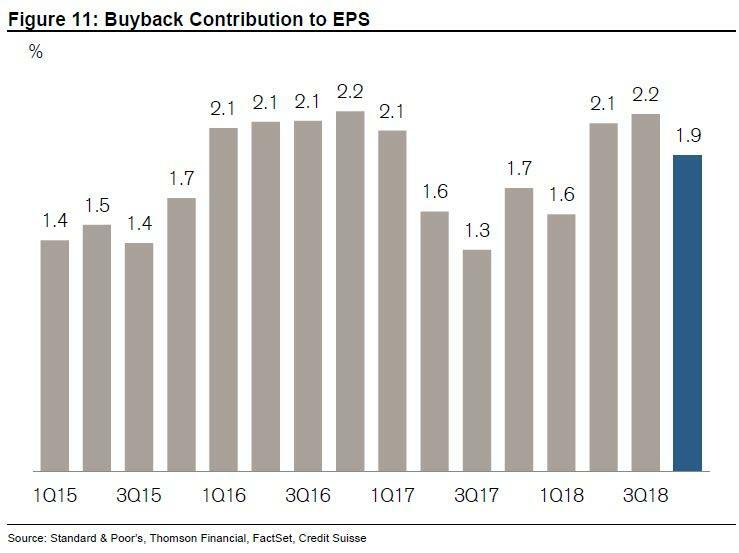 Let's not forget the massive stock buybacks in 2018: in Q4, stock repurchases will add nearly 2% in EPS growth. And while consensus also forecasts 6% sales growth in 4Q, Goldman expects fewer sales beats than the historical average (36%) given the close relationship between top-line beats and changes in the trade-weighted US dollar. The dollar has become a modest headwind to companies (+4% year/year) and could weigh on sales results. Results in Consumer Staples are still distorted by the reclassification of CVS following its merger with AET. After accounting for this reshuffling, EPS growth in the sector would equal +4%. Margins are expected to grow in every sector except for Communication Services. So far so good; the problem is company guidance about 2019 where as noted above, the mood is far more somber, and Kostin's latest weekend piece certainly reflects that. 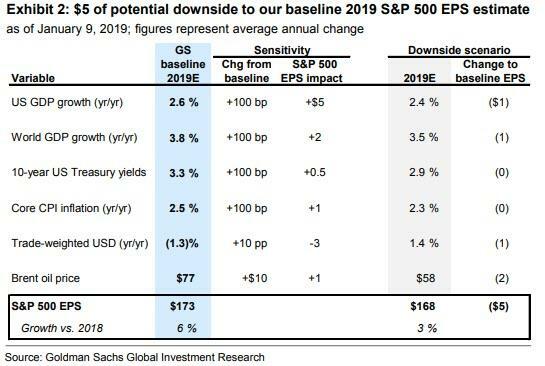 As the Goldman strategist writes, looking forward into 2019, Goldman's baseline estimate is for 6% S&P 500 EPS growth (to $173), which however assumes average annual real US GDP growth of 2.6%, real World GDP growth of 3.8%, Brent oil prices of $77 per barrel, and a slightly weaker trade-weighted USD (-1.3%). It also expects S&P 500 profit margins will be roughly flat through 2020, given rising wages and other inputs costs. This means that positive sales growth, roughly in line with nominal GDP growth, will drive nearly all earnings growth; this also suggest that absent top-line increases, or the continuation of a strong US economy, profits will decline. Our economics team now forecasts average annual real GDP growth of 2.4% for the US (-20 bp vs. baseline) and 3.5% for the world (-30 bp vs. baseline). These slower growth estimates would lower our S&P 500 EPS by roughly $2. The other major development has been the 25% decline in Brent oil prices since the start of 4Q. The futures market implies Brent oil will average $58 per barrel in 2019, $19 below our baseline. The decline in oil prices could lower our 2019 EPS estimate by as much as $2 as the hit to Energy earnings is partially offset by the benefit to consumers and corporate profit margins. Lower bond yields, lower inflation, and a slightly stronger dollar could represent modest downside to our baseline estimate ($1 in total). lower oil prices is one of the primary sources of downside risk to earnings at the moment. But Energy accounts for a much smaller share of S&P 500 EPS today than in the past. In 2014, before the subsequent 75% drop in Brent oil prices, Energy accounted for 12% of S&P 500 EPS. Today that share stands at just 5%, limiting the downside to aggregate earnings from lower oil prices. 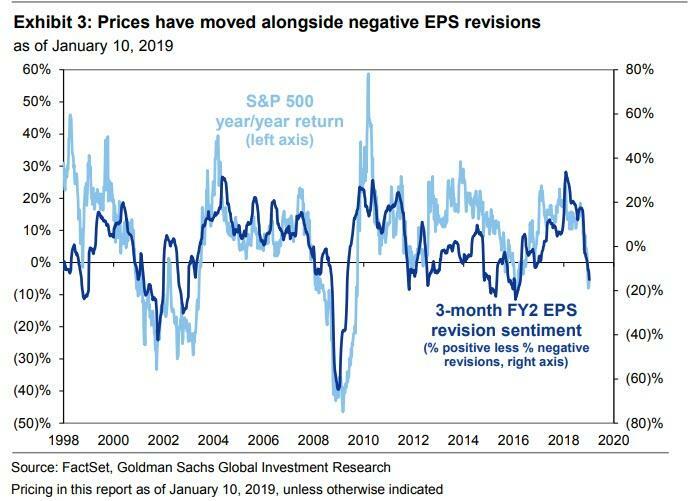 It's not just Goldman that is turning cautious on 2019 earnings: consensus itself has seen a significant rerating lower, with Wall Street estimates for 2019 S&P 500 EPS trimmed by 4% ($8) from the peak in August. Consensus bottom-up estimates for 2019 S&P 500 EPS reached a peak of $179 in August 2018 but currently stand at $171 (+6% growth). The majority of revisions this year have come through lower margin estimates, as sales growth is still expected to be strong (+7%). Consensus bottom-up forecasts now imply a 20 bp margin contraction in 2019. To be sure, none of this should come as a surprise to the market, as equity prices have tracked negative earnings revisions tick for tick, with the drop in the S&P Y/Y corresponding to the EPS revisions sentiment, defined as the number of positive EPS revisions less the number of negative EPS as a share of total revisions, and which has also slipped into negative territory. As shown in the chart below, the path of S&P 500 returns has generally tracked this revision sentiment (Exhibit 3). This, in a nutshell, is why after the December turmoil and January Fed relent, the next big "litmus test" for the near-term path of the market will come from earnings season: should more negative surprises a la Apple emerge, expect EPS revisions to take another sharp leg lower, and drag stocks with them, especially after AAPL’s guidance set in motion further negative revisions, with sentiment declining from –14% to –23% in the past week. On the other hand, with no nascent signs of slowing negative revisions, the strength of 4Q results and management commentary around the outlook for 2019 will take on heightened importance for whether earnings estimates (and returns) stabilize in the near term.